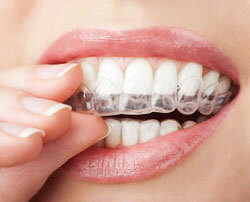 Have you avoided straightening your teeth because you don't like the look of metal braces? Luckily, there's another option available in Bredford and Keller, TX. Dr. Phu Le of Advanced Family Dental, explains how clear braces might just be the perfect solution for you. When you wear metal braces, it's not unusual to feel a little self-conscious about your appearance. It's hard to focus on how great your teeth will look at the end of your treatment if you're not happy with the reflection in your mirror. Clear braces are just as effective at correcting the alignment of your teeth as traditional braces but offer an innovative new approach to orthodontic treatment. Rather than relying on wires and brackets to reposition your teeth, your dentist gives you a series of clear aligners that fit over your teeth like a nightguard. Since the aligners are made of nearly transparent plastic, it won't be obvious to anyone that you're improving your smile. Before your orthodontic treatment begins, your dentist uses a computerized image of your teeth to custom design your aligners. Movement is accomplished by changing your aligners regularly. At the end of every two week period, you'll open a new set of aligners and begin wearing them. There are no painful adjustments or loose wires to worry about with clear braces. If your friends or family members have had braces, you've probably watched them turn down popcorn, gum and other foods that could damage their braces. You won't have any food restrictions when you wear clear braces because you'll remove your aligners to eat. For best results, it's important to wear them at least 20 hours per day. In some cases, straightening your teeth is quicker with clear braces than with traditional braces. In fact, you may only need to wear the braces for about one year. Clear braces offer the ideal way to improve your smile! If you live in Bredford and Keller, TX, or surrounding areas, call Dr. Le of Advanced Family Dental at (817) 354-7840 to schedule an appointment to find out if clear braces are right for you.